We extrude 100% of our recycled plastic slats in-house. Post-consumer or post-industrial recycled plastic is the major raw material used to create our recycled slats. The plastic begins as processed recycled resin that is fed into our extruder to begin formation of the slat. 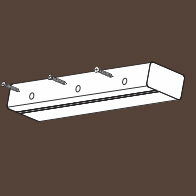 Heat and pressure are then created in the extrusion process until the desired slat is formed. We offer both standard recycled slats and our unique 2nd Site Systems® slats that combine recycled plastic with a reinforcing A36 steel bar to make it “plug-compatible” with the best wood slats available. With molded-through color and U-V resistance, our attractive and durable recycled slats shed water, resist rot, and are easily cleaned. Incredibly strong and comfortable, our benches made with 2nd Site Systems® slats resemble wood and come in maple, cherry, walnut, and gray. 2nd Site Systems® material is our creative solution to using recyclable resources and providing superb design choices. 1. Each 2nd Site Systems® slat is precision-machined to receive a reinforcing spine and fasteners. Machined slots terminate before the ends of the slats, hiding the interface. 2. 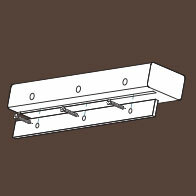 The reinforcing A36 steel bar is inserted and fasteners are placed into precisely located, countersunk holes. 3. The holes are covered with filler material. The slats are installed in the same configuration as wood slats. When we were first asked to include recycled slats in our product offering, we approached the decision from the point of view of our customers and the design community who specify products such as ours. We wanted to be able to offer recycled products that were “plug-compatible” with the very best wood species available. In short, we wanted to be able to provide many of the same wood benches, tables, and receptacles that we had developed over the past years with slats made of recycled plastic materials. We were unable to find any available material which satisfied that simple design requirement. The recycled plastic slats available at that time bowed, twisted, discolored, sagged, stretched and often resulted in products that were unacceptable. The conventional solution of adding extra supports, thickened slats, shorter spans, and other similar compromises left us unwilling to settle for the available recycled materials. Our guiding principle required that we find or develop a material which met the same design criteria as the best wood slats, so that there need not be any change in the overall character of any site plan or the amenities used in public places. In short, we wanted to create a product that made it possible to reconcile the legitimate purpose of using recycled material with the complex and varied design criteria governing modern public spaces. The result, after years of development work, prototypes, field testing, and trials of many alternate configurations is this product that has been awarded US and Canada patents. There is more going on than the drawings suggest. Two radically dissimilar materials must occupy the same space, although they react to changes in temperature, stress, expansion, etc. very differently. Precision machining of fastenings and interfaces is accomplished using state-of-the-art CNC equipment. Allowance must be made for the shrinking and swelling of materials in dramatically different ways. There is a critical interface that exists between these two materials and we must provide for its integrity independent of the direction in which stress is applied or temperatures change. This is why the grooves are precision machined, instead of formed in the extruding process. 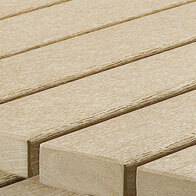 Best of all, 2nd Site Systems® as well as our Standard Recycled slats are both truly recycled. 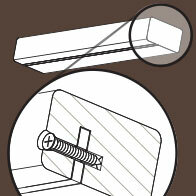 The major raw material for the plastic slats is post-consumer or post-industrial recycled plastic. All fabricated A36 steel bar components are stainless steel, the raw material for which is recycled scrap steel. This remarkable product fulfills both the concept and the spirit of creative recycling, using recyclable resources, and providing superb design options. The slats are durable and attractive, with molded-through color and UV-resistance. They shed water and resist rot. They are easily cleaned and highly stain resistant. What began as a search for a material which could adequately substitute for wood slats has resulted in a material with characteristics that, in many ways, transcend the best that wood has to offer. This deceptively simple joining of two materials has resulted in design choices beyond the most optimistic goals which we set when this process began. 100 queries in 0.331 seconds.